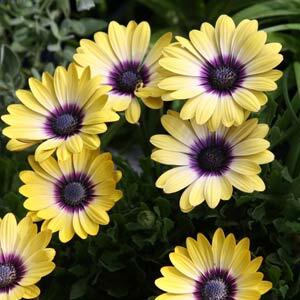 One of the vest flowering plants for full sun, Osteospermum fruticosum hybrids are a low growing perennial that will reach around 60cm. Also known as the trailing African Daisy. Long flowering from spring through summer they are related to the daisy family and are shrubby plant originally from South Africa. A mound forming plant with nice grey green foliage the main attraction is the long flowering season, and the drought tolerant nature of the plant once established. Lots of hybrid cultivars available usually in early spring when they first come into flower. Osteospermum hybrids require little care, they can be pruned back to keep in shape, a sunny position in a well drained soil is essential for goo performance. The flowers appear on new growth, so for best flowering they are pruned back each year to regenerate new growth and ensure better flowers. Propagate from cuttings taken early in spring, and replace older untidy plants. These plants are regarded as a perennial in warmer climates, however in colder areas are treated as an annual. In a warm sunny position that is not subject to cold winters, they will remain evergreen. Best grown in a well drained soil and in full sun these are a plant that will tolerate poor soils. Plant seedlings or small plants in early spring at around 30 cm (12 inches) apart. Mulch lightly around the plants to maintain a cool root run and prevent weeds. Tip pruning and deadheading after flowering will promote a bushy growth habit. Fertiliser is not required except in very poor soils. To much fertiliser will prevent proper flowering. In spring if the soil is dry it is suggested that some extra water be applied to stimulate flowering. Cuttings strike easily if taken in spring. Propagation from seed is also possible. Sow seeds indoors in early spring. Seeds are best surface sown and covered only very lightly. Keep the seeds moist and in good light however not hot direct sun. Germination should be within 21 days. Wait until the new plants are around 7cm (3 inches) tall before transplanting. Height – Will reach 6o cm in height sometimes taller. Spread – Will form a clump to around 60 cm across again, sometime more. Soil – Well drained humus rich to loamy. Flower colours – A wide rang of flower colours are available with the increasing range of hybrids. These are a low maintenance plant, however over time the stems can become a little woody. You may find that pruning them back every few years promotes stronger flowering and better foliage growth. Ostespermum fruticosum are readily available for sale from retail nurseries.